It's been a looong, loooong, looooong time since I've read The Bobbsey Twin books. I picked up a few from the series at our local used book store (1960 editions) because I have fond memories of reading about the BTs when I was young. My husband also has fond memories of these books. We thought it would be great fun to be able to hand these books over to our children. 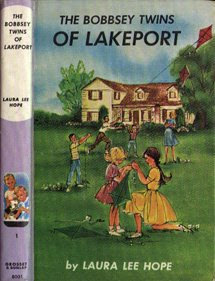 Today, for kicks, I thought I'd read through the first book in the series, The Bobbsey Twins of Lakeport . This is the first book in the series and introduces us to two twin sets of siblings. The older set of twins are Bert and Nan (age around 8?) and the younger set are Freddie and Flossie (age around 4?). (It is my understanding that in the updated editions of these books the children have been aged to 12 and 8, respectively.) In keeping with other books of that time period (i.e., Nancy Drew, Cherry Ames, etc) there is a mystery to be solved within the pages of each book in this particular series. In the case of The Bobbsey Twins of Lakeport , the children are searching an old, abandoned house for an elderly woman's missing brooch and coins. Of course, the house is speculated at being haunted, as all obliging old homes claim to be. (As a side note, I remember being 7 and speculating with a friend of mine that a neighborhood house that showed few signs of life was haunted. We would ride our bikes slowly past to see if we could spy a person. We never did but one day something clattered around that old house and you can bet we took of flying down the road on our bicycles! Terrifying experience.) Of course, the Bobbsey Twins find the missing treasures, "solve" the mystery and continue on their merry way. The thing that I found shocking in rereading this old story from my childhood days was that the Bobbsey's employ an African-American woman named Dinah to run their home. She cooks, she cleans and acts as a second mother to these children. Now, apparently the Bobbseys have seen several re-writes over the years, bringing them up to date with the modern age. Given our current president, I would suggest that these books need an additional re-write. You don't realize how much times have changed until you go back and read literature written in what is really a different era in our nations history! (And I'm glad we're in a new era where African Americans are voted in as president, btw. We've come wonderfully far and I'm so glad to see it and be alive in such a unique period in our nation's history.) It's just a wee bit shocking and it honestly makes me feel uncomfortable about handing this over to my own kids. Yes, it could open up dialogue but the question of whether or not the Bobbseys are good literature is still being begged. Given the fact that these books HAVE been rewritten on a number of occassions really makes you wonder whether or not these can be considered quality literature. A truly good and edifying book doesn't need revision. I stumbled across this website which discussed the history and story of The Bobbsey Twins. 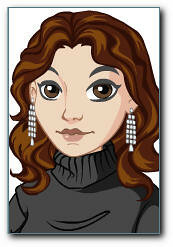 It's almost humorous to point out that they, like their counterpart Nancy Drew, never age. There ARE inconsistencies throughout the stories. I remember this and it can be quite funny at times. I have to say that after having browsed through The Book Tree and reading their arguments as to what constitutes good, classic and solid literature, the Bobbseys are falling woefully short in my eyes. Aside from their African-American house servant, and aside from the fact that their father, (who does love htem dearly, btw), refers to the younger set of twins as "Fat Flossie" and "Fat Freddie" I am not real keen on the idea of keeping these around. They are almost SO counter-culture in an alternating appalling and hilarious way that they are simply not worth the time. They aren't timeless stories but they do represent an era of children's literature that I do feel nostalgic towards. In some ways these books do not make sense and won't compute for the modern young reader. Mostly they are just books that I feel fondly towards but if I'm going to be harsh and honest about, are really pathetic reads. There are better books out there. I'm really curious to hear what you all do with books of this nature that are so out-of-date and very much NOT politically correct. Do you keep them? Do you just open up the discussion with your kids about what you believe and what is right? I can't see that these could be read without some discussion of the change in times, public opinions and really just discussing what is RIGHT and what is WRONG period. Maybe we should be thankful that the Bobbseys present an opportunity for dialogue in a clean way. At the same time, is that really best? I wonder if, as adults, we notice and are bothered by these things much more than kids are. I remember reading books like that as a child, and while I could see the "political incorrectness" of them (or at least sense that there were features in the books that represented mistakes of the past), I never absorbed it: I seemed to understand that it was part and parcel of a different era and looked past it to appreciate the stories for the good qualities. I don't pay any attention to being politically correct, in fact, I'm not politically correct. These books are a part of their time and should be read as such. I read many books form an earlier time period with my children and we enjoy them just as much as I did when I was a kid. I don't think they should be re-written, that is as bad as banning books. When I read them we either discuss the part that feels uncomfortable or I will edit on the fly suiting our families beliefs and values. I also look at the author's purpose, for example a 1930s book that portrays blacks as not PC today. Was the author trying to be predjudice in 1930 or were they writing to society's norms in 1930? Makes a big difference to me. In 75 years, people may be wanting to re-write books written today because they don't suit the future's values and norms. I read the Bobbsey Twins, but I much preferred Trixie Belden over them and even over Nancy Drew. I don't think the non-PC stuff bothered me too much because I think even then that I realized it was from a different time period. I don't think I'd have a problem with my own children reading them, either. I would just make sure they understand the time period, etc. I am 62 years old, and loved the Bobbsy Twins when I was little. There was another series that I think was called The Box Car Children about some orphaned children who lived in a box car that I thought was wonderful too. You know, I don't think I've ever read a Bobsey Twin story! From you post, about the Af.Amer. housekeeper, I don't think that will discourage me from picking up one of these to preview down the road. My own Dad, when he was a little boy in the south, had well to do parents and grew up with a "mammy" that helped around the house. I guess, if the housekeeper (no matter her nationality) is not being spoken about or to in a derogatory way, then I look it the same as those today who have a cleaning lady named Consuela or other Latino name as is prevalent in the area of the country I live in now. That said, I need to check one of these out and actually read it. I'm sure it's amusing! Great point about the Latino housekeepers, stephenie. Political correctness is ever evolving ... literature should transcend such phases. Unfortunately, too many people want the wealth of thousands of years to fit into the box that is the 21st century. Rewrite a story often enough and you write the story away. I think that is what makes a children's book an enduring classic -- the fact that although there may be some differences, the main idea stands up (I notice words like idiot and stupid used that are considered the worst of profanity in homes today!). I agree that the African American househelp isn't the main thing, but if it feels SO dated -- not classic, but instead unrelatable -- I say toss it. By the way, now that I know you better, I still don't understand why you don't like Freddie. Interesting point about really good books not needing revisions. I have warm fuzzies about the Bobsey twins from reading them as a kid, but I remember absolutely nothing about them. I guess they weren't great literature, but I think that sometimes, it's okay for kids to read light stuff, too. I think there are books--literary books--that display the attitudes of their time and are worth reading yet because of the life-lessons and humanity they portray. I don't think the Bobbsey Twins fall into that category. They are formulaic and trite (and yeah, I read several when I was a kid, too). I think the "fat flossie" and "fat freddie" would bother me more than the racial overtones. It's interesting that these books have been rewritten to make them "more current." In '1984,' they have a whole department in charge of erasing and rewriting history, so that the current administration appears to be infallible. I'm not sure whether the Bobbsey twins are quality literature or not, but I question the idea of removing aspects of them that are evidence of our past as a culture. Anyway, I popped in because I've never read the Bobbsey twins, and I was curious. Thanks for the review. I'm thinking I'll stick with the Boxcar children with my kids -- even though they have a few oddities of their own! Interesting analysis, Carrie. Last year I read 2 Bobbsey Twins books to William. He enjoyed them and so did I. They are originals that I got from my mom. I did edit as I read, though. I don't have a problem with them having an African American housekeeper. Or the dad going off to work. Basically my edits were to pronounce the housekeepers words with regular speech unlike the way they were written. We'll probably read some more Bobbsey Twins. For me they were a precursor to Trixie Belden who then lead to Nancy Drew. I'm definitely interested in the re-written books. Though I find modern books are usually too modern for my tastes. I gave all my Nancy Drew books to my girlfriend's daughter. She loves them and I don't have girls. I also have all my Happy Hollister books. I love rereading them too. I've offered them to my 10 year old (the one who loves mysteries), but so far he hasn't bitten. He might. I just wanted to comment about the African American nanny/maid you spoke of in the Bobbsey house. I am African American and I am not offended by the existence of books that portray AA in the 50's in these sort of jobs. (As long as the people are portrayed in a positive light as caring and competent etc... & there is no vulgar or racially charged language) That is just how it was back then. I think if we ignore how it was then we will be unable to appreciate how far we have come since then. During the 50's my Dad was working on his PhD and it was a difficult time for AA's. Now he's in his late 70's and he did not expect to see an AA president in his lifetime. I feel truly blessed that the history starts with a Slaves (great-greats), Crossing Guards & share croppers(what my Dad did before becoming a PhD) and ends with his PhD & my moms JD. So I'd just encourage everyone to discuss the past frankly, as we celebrate the present. Thanks for your book review, I am glad that I read it before I read the book to the kids. Now I can talk to them about the past. While you're busy re-writing history and literature, don't overlook Mark Twain, Shakespeare, every fable or fairy tale of any time or culture ever written, Rudyard Kipling, ad infinitum. If you find an old snapshot of some long-forgotten ancestor, will you have it edited and tweaked to update their style and manner of dress? Will you have the depicted surroundings and behaviour "photoshopped" to eliminate outmoded or less-than-ideal characterisations? Thanks, all, for your thoughts and comments. In re-reading the BT,I realized it wasnt' really QUALITY literature. Fun and nostalgic, yes, but not QUALITY. If something is quality, I have no desire to change it or toss it out. It is what it is and it speaks to something in our history. (I am adamantly opposed to re-writing series to fit modern audience. Anyone who has read my diatribes about reading 1930's Nancy Drew should know that! I'm for original works!) But the BT just weren't very well written and so they raise question marks. Which, btw, I did let my BT books go after re-reading them. It's not that I think they are inherently evil. There is just better quality reading material out there and I'd rather make the most of my children's reading time. Stumbled across this post and enjoyed it. I am something of a Bobbsey Twins expert, I've read pretty much all of the books in original two series (in one edition or other) and collect original editions. So I'm very well acquainted with the--shall we say ante-deluvian aspects of the original editions. What makes them questionable is not that they have a black maid/housekeeper (plus her husband, also black, who is the handyman--Sam and Dinah live with the Bobbseys in a garage apartment). It's how this is portrayed. For one thing, Dinah's dialect is along the lines of "sho' nuff, Massah Bobbsey!" --it's VERY stereotypical. There's even a line where she jokes about how "back in Verginny" she used to "steal de wattuhmelons!" Dinah and Sam are extremely sympathetic characters but they *are* stereotypes. They are written with much more dignity and gravitas in the later editions. There are other stereotypes which are not so innocuous--in The Secret at the Seashore (the third book), everyone is looking for the younger twins and they come across a carnival which has a fortunetelling booth staffed with gypsies. The gypsies are described as liars, cheats, con artists and would-be kidnapers--there's a line about how "she pretended to look through some dirty cards in order to tell the future" and "'No, lady. Gypsy tell lady's fortune, then lady find them,' she suggested, with that trick her class always uses." It's very odd, there's a strong editorial POV in this section that is atypical for these book--it's almost a warning to the presumed child-readers. Perhaps the oddest example of outmoded attitudes is when the book is talking about Flossie's doll collection--she has like 10 of them, including Jujube, the "colored" doll that Sam and Dinah gave her. She keeps the dolls in a drawer, and separates Jujube from the others with a shoe box lid. Yep, you got that right--doll segregation. With all that there's an innocence that's enjoyable and I certainly enjoy rereading them (old-fashioned as they are, I like how Flossie is very quick to stand up to Freddie--at least they're not *too* sexist) but I don't think they qualify as classic literature. Just found this post. I recently read the BT in the Country...an edition that has no copyright in it, but I believe said Christmas late 1930s or early 40s. I was thrilled when I found it at the home of my husband's grandparents...and they've let me have any of their old books that I want. Anyway, I was also repulsed by the way Dinah was written...the way she spoke, the way they treated her...all of it. And I didn't think I was for revisions, but now I can understand why they would be needed. However, I also appreciate that I can understand the time period much better. I actually found the story to be quite boring, too. This story focused on the younger children...but still. There was also the issue of children rolling a tobacco-free cigarette and starting a fire...using a gun...and I don't remember what else. Those I can also take into account of the time period. Even when I was a kid everyone had knives if they lived on a farm. Though I'm pleased to have such an old book given to me...and truly a children's classic...I don't feel the need to read any more BT. I should add that the family didn't outright disrespect Dinah...she just wasn't respected the way I wish she could have been. Though they loved her, she was still very much a servant...and not just "help." One thing that must be understood, the original #1 story of the Bobbsey Twins was written in 1904. I have seen so many comparisons to Nancy Drew (which started in the early 30s) and Trixie Belden (which started in the late 50s/early 60s) They are 3 completely different eras. I actually LOVED the series as a kid, and had a couple of the pre WWI books in original format. I understand the sentiments towards blacks are outdated, but i truly feel that the author was putting Dinah and her husband Sam in a positive light (for the time) It wasn't meant to be prejudiced-just a kids story. That being said, i liked the 2nd and 3rd series best (both from the '80s) These aren't rewrites, but new stories with the Bobbseys as more of a crime-fighting team (a la the Hardy Boys or the Three Investigators) Those appealed to me more-my sense of adventure. I think you are being too heavy handed on a classic piece of literature. Aside from the obvious that times have changed, the times were, in fac, the times. That was how it was. I remember as in the sixties people be "fat friends" it was a term of endearment. Regarding the character of Dinah, If I'm not mistaken wasn't Calpurnia in To Kill A Mockingbird, a black housekeeper? Or should I said African American housekeeper?? Children should read the books as they were originally written in my opinion. If you feel the values were so poor back then, use it as a learning experience.